Asked whether he had anything to say before sentencing, Arthur Topham made a statement that will ring through Canadian history about the nature of free speech and the motivations of an extremely moral and honest man.. He posted what he had as a critic of Zionism, not out of malice or hatred, but driven by a moral imperative to warn people of a perceived danger. ““I felt that I had a duty as a Canadian citizen to alert the general public of an imminent threat … the interests of the Jewish lobby,” said Topham in court March 13, according to the CBC. Arthur Topham’s 10 year ordeal of harassment for being a strong critic of Zionism, ended in a Quesnel courtroom when he was sentenced, having been convicted in November 2015 on one count of violating Canada’s notorious “hate law” Sec. 319 of the Criminal Code, as a result of postings highly critical of Zionism and organized Jewry. Ironically, the charge revolved around books readily available from mainline online booksellers.. The Internet dissident became technically another political prisoner in Canada’s sordid attack on free speech. Amnesty International defines a political prisoner as a person punished solely for the non-violent expression of his political, religious or cultural views. Judge Bruce Butler sentenced Mr. Topham to a six month suspended sentence during which he must reside at his home, refrain from alcohol, report to his probation officer and not post anything on the Internet. After that, he faces two years of probation. On March 10, he shut down his massive RadicalPress.com website, the contents of which, we assume will be mirrored by others in less repressive lands than Canada. “In a sense, the thought control freaks got part of what they wanted — the silencing of this dissident,” said Paul Fromm, Director of the Canadian Association for Free Expression which had backed Mr. Topham during the first legal assault by complainant Harry Abrams,a complaint to the Canadian Human Rights Commission under the now repealed Sec. 13. CAFE continued to back him when Abrams, a B’nai Brith spokesman in Victoria, teamed up with chronic Ottawa complainer Richard Warman who complained to the British Columbia “hate squad” which led to the Sec. 319 charges. In sentencing Mr. Topham, Judge Butler rejected Crown submissions for a stiffer sentence and 200 hours of community work. The judge also rejected allegations that Mr. Topham indirectly advocated violence. The CBC (March 13, 2017) reported: “One piece that Topham called ‘satire’ advocated the forced sterilization of all Jews. ‘He does not call for violence; his views were political satire,’Butler told the sentencing hearing. ‘It is not his intent to indirectly incite violence.’ Butler ruled that Topham deliberately used the internet to disseminate anti-Semitic information but said the man was not calling for violence.” The satire in question was Israel Must Perish, a parody Mr. Topham wrote of a hideous blueprint for genocide Germany Must Perish, written in 1941 by an American Jew named Theodore Kaufman, calling for the mass sterilization of German Jews after the war, an act which would eliminate the Germans as a people within a few decades. No one was happy with the sentence. Free speech supporters see the gagging of Arthur Topham as one more atrocity committed under Pierre Trudeau’s fadulent Charter of minority special rights and diminished Majority freedoms. Whew, if you reside in any of 20 countries, including Germany, Austria and France (the land of liberte? ), the Zionist censors at You Tube will block my report (reproduced below) on Day 2 of the Arthur Topham challenge to the constitutionality \of Canada’s “hate law”> The report coverage Tuesday, October 4 and also introduced another censorship victim Monika Schaefer who provided a report on the suspension without pay of Professor Anthony Hall for the non-violent expression of his political views. We see the desperation of the New World Order followers to stifle the growing dissent and torrent of information that counters decades of lies and managed news. Even more people will join the dissent as they learn about others like them out there fighting for the same ideas. Hence, the latest efforts to close down discussion of important current issues. Today Brian Ruhe who produced and hosted the show received the following notice from You Tube. YouTube blocks content where necessary to comply with local laws. Please review our help centre article on legal complaints //support.google.com/youtube/answer/3001497?hl=en-GB. B.C. man convicted of promoting hate on web challenges law in court. – Day 2 & B’nai Brith Instigated Suspension of Freethinking Prof.
Instigated Suspension of Freethinking Prof.
Paul Fromm and Monika Schaefer talk with Brian Ruhe on Oct. 5, 2016 regarding Arthur Topham’s constitutional challenge in Quesnel, British Columbia. Mr. Topham is challenging Canada’s notorious “hate law.” Monika Schaefer reports on the B’nai Brith instigated suspension without pay of freethinking professor Anthony Hall at the University of Lethbridge. In a shameful display of state hubris, Canada is using illegal concocted provisions of its Criminal Code to prosecute a citizen for innocuous postings on a personal blog (The Radical Press). The provisions allow a maximum 2-year prison sentence, where the state prosecutor (“Crown”) does not need to prove intent to harm or any actual harm to a single person. Intent and actual harm are not even relevant legal considerations in the proceeding. Both harm and intent are presumed.The said Criminal Code provisions are straight out of the playbook of a totalitarian state. The show trial was separated into two parts, despite the objections of the accused. In the first part the accused was found criminally guilty, for one blogpost, while not guilty for the other blogpost of the Crown’s charge. In the second part, which is scheduled to start tomorrow Monday October 3rd, the constitutionality of the law is being challenged on limited grounds. Any sentencing will be decided after the ruling on constitutionality. The process of thus dividing the show trial into two parts is equivalent to first determining that the witch is guilty of blasphemy or worst, followed by a hearing to determine if burning at the stake in the town square is still within the bounds of community standards, rather than evaluating the legitimacy of the law at the same time (and before the same jury) that the nature of the “offense” is evaluated. Meanwhile, the “defendant” was gagged from identifying the original complainants (the usual crew) but allowed to continue blogging about the process until a conviction is finally secured, and has mounted a funding campaign for the expensive constitutional challenge. 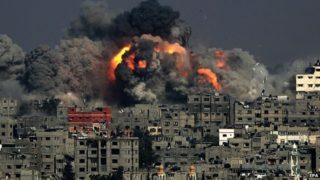 These kinds of show-trial proceedings and the associated media assaults are attempts to create a false impression of a victimized Israel, to shield the apartheid state from international condemnation for its on-going violations of the Geneva Conventions, illegal annexation, constant violations of human rights, and mass-murder “mowing of the grass” in Gaza. Israel wants a free hand to continuously expand by the same criminal methods it has used for decades. Therefore, when successful, the domestic show trials (most prominent in Canada, France, and Germany) are geopolitical in character by virtue of Israel’s leading role in US interference in the Middle East, with Canada and France as lead accompanying sycophant states. Canada’s Ontario Civil Liberties Association (OCLA) has defended Arthur Topham against the state’s attack on freedom of thought and expression with several interventions. OCLA applies the principle that those who’s views are most at odds with orthodoxy and who are most aggressively attacked using the state apparatus are those most in need of civil defense. The OCLA’s 2014 on-line petition to the state authority gathered over 1,400 signatures. OCLA also, in 2015, intervened by letter against other “civil liberties” associations that adopted a statement that harmed Mr. Topham’s case. The Ontario Civil Liberties Association (OCLA) wishes to make this intervention, in letter form, to assist the Court in its hearing of the defendant’s constitutional challenge of s. 319(2) of the Criminal Code (“Code”), to be heard in the Supreme Court of British Columbia. The defendant submits that s. 319(2) of the Code infringes on the s. 2(b) guarantee of freedom of expression contained in the Canadian Charter of Rights and Freedom, and is not saved by s. 1 of the Charter. The impugned provision in the Code does not require the Crown to prove any actual harm, and no evidence of actual harm to any individual or group was presented in the trial of R. v. Topham. There is no “direct and immediate connection” between Mr. Topham’s expression on his blog and any threat that would permit restriction of his expression. The OCLA submits that the current jurisprudence of the Covenant, including the 2011 General Comment No. 34, represents both Canada’s obligation and the current status of reasonable limits prescribed by law as can be demonstrably justified in a free and democratic society, in relation to state-enforced limits on expression. The process and the jury-conviction to date in the instant case establish that s. 319(2) of the Code exceeds these limits, and is therefore not constitutional. Furthermore, s. 319(2) of the Code allows a maximum punishment of “imprisonment for a term not exceeding two years”. The Code punishment of imprisonment exceeds the “strict tests of necessity and proportionality” prescribed by the Covenant. In addition, in paragraph 47 of General Comment No. 34, it is specified that: “States parties should consider the decriminalization of defamation and, in any case, the application of the criminal law should only be countenanced in the most serious of cases and imprisonment is never an appropriate penalty.” [Emphasis added.] In the penal defamation envisaged in the Covenant, unlike in s. 319(2) in the Code, the state has an onus to prove actual harm. Finally, the OCLA submits that the feature of s. 319(2) that gives the Attorney General direct say regarding proceeding to prosecution (the requirement for the Attorney General’s “consent”) is unconstitutional because it is contrary to the fundamental principle of the rule of law, wherein provisions in a statute cannot be subject to arbitrary application or be politically motivated or appear as such. The fundamental principle of the rule of law underlies the constitution. For these reasons, the OCLA is of the opinion that s. 319(2) of Canada’s Criminal Code is unconstitutional and incompatible with the values of a free and democratic society. If the Court requests it, the OCLA will be pleased to make itself available to provide any further assistance in relation to the instant submission. Defendant’s “Memorandum of Argument Regarding Charter Issues”, R. v. Topham, Court File No. 25166, Quesnel Registry. Saskatchewan Federation of Labour v. Saskatchewan [2015 SCC 4], at para. 64.
 International Covenant on Civil and Political Rights, Article 19, at para. 2. Ibid., Article 19, at para. 3, and Article 20. General Comment No. 34, UN Human Rights Committee [CCPR/C/GC/34], at para. 22. Criminal Code (R.S.C., 1985, c. C-46), s. 319(6). For a recent example where unconstitutionality arising from the rule of law was the main issue before the court, see: Trial Lawyers Association of British Columbia v. British Columbia (Attorney General), 2014 SCC 59 (CanLII); and see Committee for the Commonwealth of Canada v. Canada,  1 SCR 139, 1991 CanLII 119 (SCC), p. 210 (i). Paul Fromm Gives Preview of Arthur Topham Constitutional Challenge to Be Held In Quesnel, BC, October 3-7. This has been a hectic few months for freedom of speech and this Fall promises to be no different. OK, the headline may be a little harsh, but some of our fellow Canadians are narrow-minded vindictive bullies who care not a wit for freedom of speech. Frankly, you and I have a lot to do to turn people on to freedom of speech, to remind them of our proud heritage of individual freedoms now so battered by the Maoist Red Guards of political correctness, and to stand up for the victims of persecution. Consider Monika Schaefer. 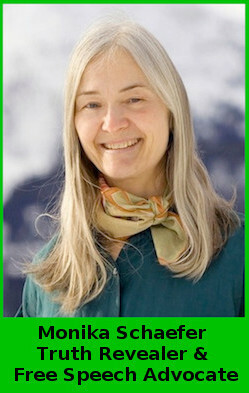 She is a violin teacher and four time Green Party candidate from Jasper, Alberta. She has lived in that community for 35 years. She raised her daughter there. She was a community activist and volunteer, devoting hours of her time and fiddling to support worthy causes and entertain at benefits. An open, honest friendly woman, Miss Schaefer had many friends in this small Alberta mountain town. She doesn’t have as many today. In mid-June she posted a short video on You Tube — Sorry, Mom, I was Wrong About the Holocaust https://m.youtube.com/watch?v=E0_BZphQ7Qo&feature=youtu.be 4m48s. Monika was the daughter of post war German immigrants. As a girl, she was mocked and occasionally called “Nazi” by school children. She bought into the indoctrination and the Hollywood version of World War II. She even scolded her mother and wondered why she hadn’t “done something” about what was happening to Jews in WW II. Over the years, Monika grew skeptical about many things. She became a major doubter of the official line about 9/11. Beginning in 2014, she began reading and came to reject the standard doctrine about the “holocaust.” Her video on You Tube went viral — over 120,000 hits in two months. * The President of the local Legion banned Monika from being on the premises. The Legion is a favourite local gathering place for musicians. So, this ban in quite serious. When Monika tested the ban, an officious bartenders called the cops. * The Legion president made complaints to the Canadian and Alberta Human Rights Commissions, to the RCMP and the German Embassy (what? Monika was born in Canada!). “It is a hate crime,” proclaimed Ken Kuzminski, the Legion president and former NDP candidate, about Monika’s soft spoken video. Kuzminski had been a longtime acquaintance of Monika’s. * Several longtime musician friends cut Monika off cold, There have been threats against her livelihood as a violin teacher. * Monika, ever the community activist, had lobbied for several years for the town to permit busking; that is, musicians can perform in parks or on sidewalks and receive donations from passersby. This Spring the town council approved busking. Monika applied for a permit and was turned down. Dave Baker, Director of Habitat for the Arts, told her:“We have considered your application for a busking permit in Jasper. In light of your recently publicly proclaimed non-inclusive beliefs we have decided to decline a permit to you at this time” “Non-inclusive beliefs”? Any belief is “non-inclusive” as it rejects other beliefs. If you’re a Buddhist, you reject Islam, and are, therefore, “non-inclusive.” The charge is Orwellian and nonsensical. CAFE’S RESPONSE: Throughout her ordeal CAFE and our supporters have rallied to Monika’s defence on the Internet, with letters to the offending parties, with videos — thanks Brian and Lawrence. We are getting the story of her case out there on You Tube. CAFE organized a quick tour of Ontario (London and Toronto) in August; we have more meetings planned for Vancouver and Edmonton over the next few weeks. Needless to say, this costs money. One of the most pressing cases is Arthur Topham’s “hate law” — Sec. 319 — case resulting from postings on his website Radicalpress.com. Last November, after a 12 day trial, a jury convicted him on one count of “hate” and acquitted him on another. Now comes the second phase — his challenge to the constitutionality of the “hate law”. In the Keegstra appeal in 1990 argued by the late Doug Christie, the Supreme Court by a narrow margin upheld the constitutionality of the “hate law”, agreeing that it was an infringement on free speech but was justified because of the allegedly deleterious effects of “hate propaganda” on “vulnerable minorities.” Arthur is arguing that the context is different. Mr. Keegstra had a captive audience in an Alberta classroom. As Doug Christie argued, the Internet is a completely different context. People have to seek out the posts on a website and can exit at any time. Also, evidence presented by Dr. Persinger at the Marc Lemire Internet Sec. 13 case established that the science which the Supreme Court relied on in 1990 was junk science. Neuropsychology has established that the alleged effects of “hate speech” on “vulnerable” minorities — fear, depression, withdrawal from society, booze, drugs — do not exist. Indeed, many of the “vulnerable” minorities, especially Jews and the LGBTQ crowd, hold privileged and powerful positions in society. This challenge is crucial. CAFE’S RESPONSE: From the start, we have backed Arthur’s principled struggle for free speech. We were an intervener in the Sec. 13 Canadian Human Rights case — abandoned after the law was repealed in 2012. When “hate charges” were laid after complaints by Harry Abrams of B’nai Brith and Richard Warman, neither of whom bothered to show up at the trial their mischief-making had set in motion, CAFE has been actively involved in Mr. Topham’s defence. We have helped raise money. Last Fall, I provided daily e-mail and short video reports on the trial. I shall again be attending the proceedings in Quesnel and providing daily reports. If you are not already on my e-mail list and want to receive these reports, contact me at paul@paulfromm.com. Brian Ruhe, a gentle Buddhist instructor and lecturer on meditation in Vancouver, now turned prolific revisionist videographer has, over the past year, lost a number of part-time lecturing positions at Vancouver area universities, colleges and school boards. He has been the victim of a campaign headed by B’nai Brith’s Harry Abrams who publicly proclaimed his desire effectively to impoverish Mr. Ruhe and deny him an income. Abrams wrote to Georgia Straight (August 28, 2015): “I have written to the Vancouver parks Board and have asked them to replace this unsavory fellow ASAP. According to Ruhe’s own postings, his Capilano teaching gig was discontinued soon after an important local [Jew] o complained to them too. Also worrying are his associations with white supremacist leaders like Paul Fromm, who himself was disqualified from teaching in Ontario for neo-Nazi racial activism.” The price for dissenting from political correctness would seem to be penury. As we go to press, Brian has been fired by the Delta School District. Reasons provided by the Board state: “ The YouTube videos compiled under your name present a very public expression of conduct that runs contrary to the policies and values of Delta School District. … As well, Delta School District’s Values statement, part of its overall Vision statement, is ‘Caring, Respect, Responsibility, Community, and Excellence’, with ‘acceptance’, ‘equality’, and ‘inclusion’ key terms within that statement.” Apparently, acceptance and inclusion do not apply to accepting and continuing to include Brian, despite a successful 15-year track record with the Board. CAFE’S RESPONSE: CAFE has written numerous letters of support for Brian through his long battle. We have offered advice and have co-produced numerous You Tube videos with this personable and talented videographer. The McCorkill will case was one of the most important ones in which CAFE’s been involved. The McCorkill will — a bequest to the U.S. White nationalist National Alliance — was nullified by the New Brunswick Court of Queen’s Bench in 2014. We appealed to the New Brunswick Court of Appeal. In a dismissive, contemptuous one page decision, in 2015, they denied our appeal and slapped us with $9,000 in costs to the various parties. We took a chance and risk and sought leave to appeal this vital freedom of speech, freedom of belief and property rights case to the Supreme Court of Canada. On June 9, in a decision without reasons, a three-person panel of the Court denied us leave and slapped us with costs — about $6,000. All I can say is that we tried hard and had a very well-prepared and aggressive lawyer, Andy Lodge of St. John, New Brunswick. That leaves us with almost $35,000 in unpaid bills. CAFE is moving with the times and producing several You Tube videos monthly on free speech issues. None of this work can continue without your help. Please use the attached coupon to send us your most generous donation to help fund our Fall activities. For a donation of $100 or more we’ll send you the dvd of Monika Schaefer dynamic speech (and fiddle playing) at the CAFE meeting in Toronto, August 23. As well, if you have not already renewed your subscription ($15) to the Free Speech Monitor, please do so.CAFE’s 34 years of free speech activism have only been possible because of the generosity of a small band of free speech supporters like yourself. ___ Here is my donation of $_______ to help CAFÉ’s ambitious campaign for free speech to support Arthur Topham and other censorship victims this Autumn. ___ We fought the good fight but were stymied by the Supreme Court. Here is my donation to help defray the costs of the McCorkill Appeal. ___Please renew my subscription for 2016 to the Free Speech Monitor ($15). $___ Doug Christie booklet or video order from back of this coupon. For 30 years, Doug Christie, the Battling Barrister, has been Canada’s outstanding free speech attorney. He passed away of liver cancer, all too young, on March 11, 2013 at age 66. Order his outstanding free speech booklets published in C-FAR’S Canadian Issue Series and speeches he gave over the years.